Aiyagomahala Creek (aka South Arrigetch/Hot Springs Creek) at the end of the long Class III section and just above the Class IV. 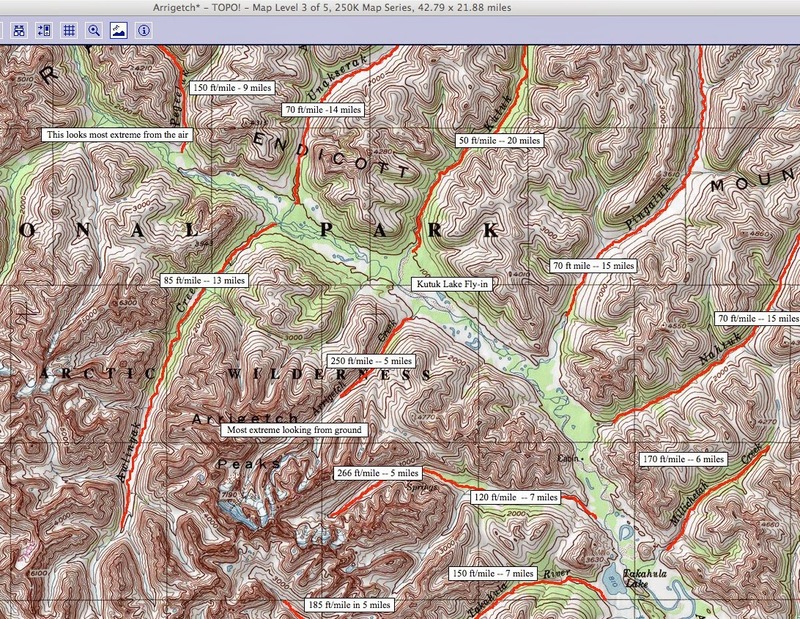 For a number of years I wanted to fly into the Alatna Valley with a basecamp and big group to explore the many creeks that radiate (see last map) out from the Arrigetch Creek area. In a 20 mile stretch of the Alatna there are four creeks on the river left bank (Nahtuk, Pingaluk, Kutuk, Unakserak) and another four on the river right bank (Awlinyak, Arrrigetch, Aiyagonahala, and Takahula). The idea was to hike on the wonderful game trails and ridges then float down the various creeks. I’d walked down the Nahtuk in 1986 with Peggy and packrafted its lowest reaches, but also marveled at its inner canyons. In the early 2000’s Thor and Ralph Tingey and later a trio of PJs packrafted Unakserak. In 2010, Andrew Skurka and I walked down the Pingaluk valley on wonderful animal trails while I drooled over its splashy rock garden canyons. Without a drysuit, PFD, helmet, nor partner similarly equipped or interested in running its Class III looking water, I regretted not paddling it. I’d also spent a month in the late 70s rock climbing in the Aiyagomhala Valley, and walked up Arrigetch Creek and over to Awlinyak a number of times: all three of those looked good for some boating, too, and in 2010 Dave Weimer packrafted Awlinyak. In a blog post I measured the gradient for all the creeks, too, and saw that there was potential from Class I on the Alatna to Class V on Aiyagomahala, Arrigetch, and the upper reaches of Awlinyak Creek. After pricing out our options, it was most cost effective for nine of us (me and Peggy; Gordy Vernon; Toby Schwoerer; Mike Curiak; Ole and his brother Dennis Carrillo; Kim Mincer and Joe McLauglin) to drive to Coldfoot and fly with Coyote Air ($1596 for 1250 pounds) on wheels to a gravel bar near the mouth of Arrigetch Creek. After a week the pilot Dirk Nickisch returned to pick up Ole, Dennis, and Peggy and left Thai Verzone, Cliff Wilson and Stefan Milkowski. After the second week, Mike, Kim, Joe and I flew out from a gravel bar strip a mile and a half upstream of Aiyagomahala Creek (aka Hot Springs Creek and South Arrigetch Creek) while Gordy, Thai and Cliff walked the 80 miles to Anaktuvuk in 4 days -- Pingaluk to Kevuk (packraftable) to Walkaround to Yenituk (tussocky!) to John River (more tussocky!!) and Toby and Stephan walked to the Haul Road more leisurely. We had bear barrels from nearly 3 to 30 gallons; a bear fence; a nine-person bug net shelter; a shade/rain tarp; basecamp food, clothes and tents. We had the sunny promise of June in the Brooks Range before Solstice, with, hopefully few bugs and lots of runoff. Ultimately we had the sunshine and few bugs (until late June when rain and bugs arrived in force), but not really enough water for everything. In fact, Pingaluk and Nahtuk were dry (only inches deep); Kutuk (Class II+), Awlinyak, (Class III-) and upper Aiyagomahala bony; Arrigetch (Class IV) and lower Aiyagomhala (Class IV+) just right. (1) a long day trip up and down the Kutuk (6 mile hike followed by a 6 mile Class II+ float down Kutuk and 1.5 miles on the Alatna). Highlights are views of the Arrigetch and fun little boulder gardens on the Kutuk. (2) an overnight via Peak 4200 on the Unakserak (12 mile hike + 9 miles on Unakserak + 8 miles on Alatna). Amazing summit and fun climb up this peak prominent to the NW of our base camp. Some really good ridge walking connecting Kutuk and Unakserak valleys. (3) a two night trip up Arrigetch Creek, over 6600 foot Ariel Peak and out Awlinyak Creek – possibly the best three day trip I have made (17 mile hike over 6600 foot summit + 14 miles on Awlinyak + 8 miles on Alatna). Gordy said the summit view was the best he'd ever seen from a mountain-top, looking out at the Arrigetch Peaks all around us. The creek was spalshy and full of grayling too. The weather perfect. (4) an overnight down the Alatna, up Pingaluk via 2100 foot bluff, and over ridges back to BC with stunning views of the Arrigetch (4 miles on Altana + 22 mile hike over 3900 foot peak). Disappointed that there was no water in Pingaluk. 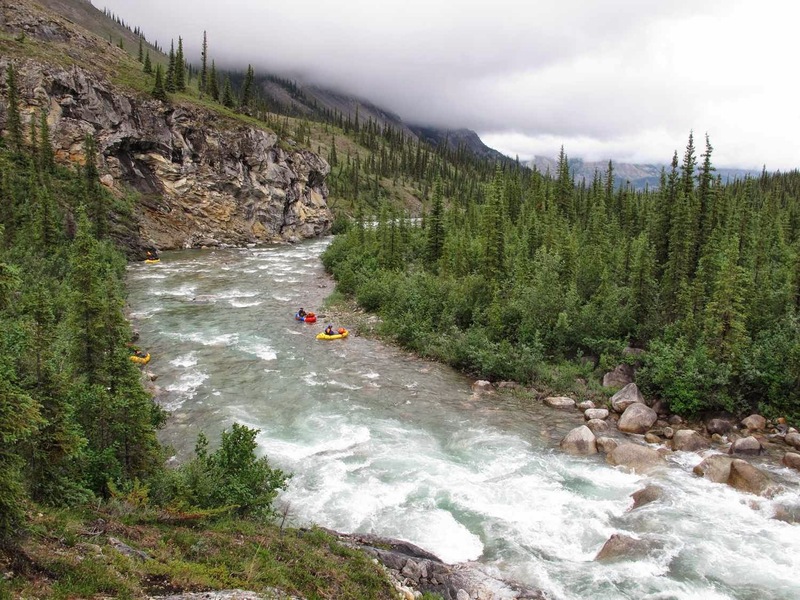 The best whitewater landscape route in Gates of the Arctic would include this creek after the John River and finishing with a hike into the Kobuk headwaters for some lightly loaded rafting toward Walker Lake and maybe beyond. (5) a day trip up Arrigetch Creek for an "instant classic" run of Arrigetch Creek that ultimately disemboweled my boat with sharp schist (3 mile hike up 1.2 miles + 300 vertical foot Class IV + 2 mile hike out). Until I cut my boat this was the most fun mile of packrafting I may have ever had. Comparisons to Ship Creek, Magic Mile, and Little Susitna were inevitable. A pool drop schist canyon w/big granite boulders too that thinned out near the bottom exposing the razor sharp rocks. The U shaped cut was maybe 2 feet long and reached from deck to hull. Bummer! (6) a three day trip from BC to upper Aiyagomhala and out to the Alatna (25 mile hike + 8 mile paddle including a 200 ft/mile Class IV+ section) for pickup where some of us walked and some of us rafted and those rafting found exactly what we were looking for: challenging whitewater like Little Su in lightly loaded boats. Hot springs and beautiful bedrock waterfalls and slides on upper Aiyagomhala ("Little California"). Not enough water and some ugly stop rocks at the bottom of the drops in the "Little California" section of Upper Aiyagomahala. After the rain we could have put in at Hot Springs and ran from there but instead walked a mile or so downriver and put-in there to run nearly constant Class II and III to a mile or so with five Class IV and above drops, all of which we ran. Going in earlier than we did (we were there June 16-30) could mean better water from snowmelt and even fewer bugs (some of us never used bug dope for the first twelve days); July would have bad bugs (as discovered by those who walked out first week of July); August would be hit or miss with water and would have dark nights, but pretty colors. Spending a month in an Alatna basecamp with rock gear (see http://www.stanford.edu/~clint/arrig/index.htm) as well as elbow pads and face masks and beefed up packrafts could be even more fun: Rainy? go boating! Sunny? go climb granite peaks! There are plenty of steep creeks left on both sides of the Alatna (as well as clean lines on rock). For example Upper Aiyagomhala and the lime-section of Arrigetch (i.e upper canyon -- we did lower canyon) have some obvious Class V+ potential. We left those drops for the next-gen packrafters. Well Roman, a nice month of paddling, pity you had not enough water. We will be, 6 belgians, in July in that aera. What about the Nathuk river if the water level is good enough, class 3 or more in the canyon? I think watch for Class IV in the Nahtuk Canyon, but can be portaged. Looks like an exciting trip.